Gone are the long summer days of starting runs at 5am, or running until after 9pm without some sort of supplemental light. We are just past the autumnal equinox and I am already relying heavily on a headlamp, at least for a portion of my runs several times per week. I have a handful of lights, some that are more than 500 lumens, but are somewhat heavy with large battery packs and require a vest or pack to stuff away when not needed. 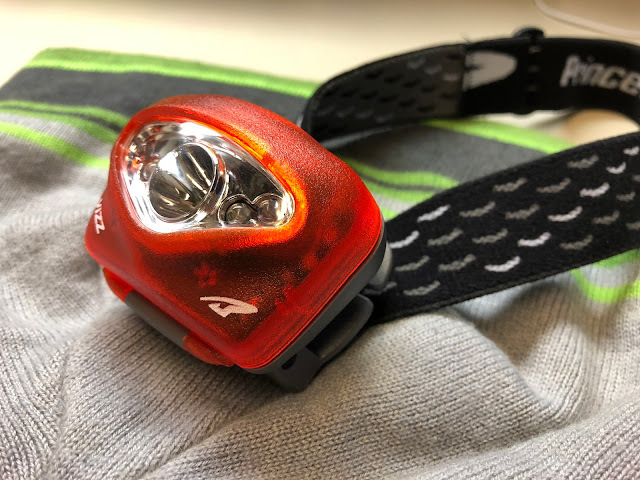 I go to these lights for any longer runs that will be 100% in the dark or in complicated, unfamiliar terrain or where route finding is critical. However, for the majority of my bread and butter running on familiar trails, I have recently been more interested in headlamps that project the most light for the least amount of weight. 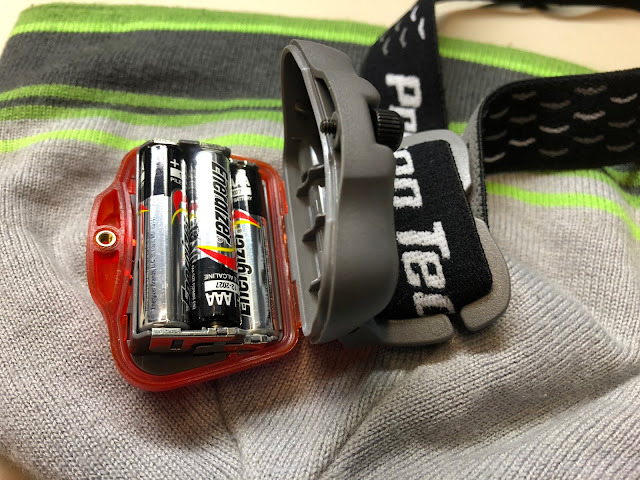 Battery life is important, but less critical, given that my morning runs I'll just need the light for the first half of my run, 30 minutes or an hour, or to just get me through the end of a run for the same amount of time. Or, lightweight enough to keep in your pack for just in case emergency circumstances. The Actik Core weighs in at 82 grams (16 grams lighter than my Garmin Fenix 5X GPS watch! 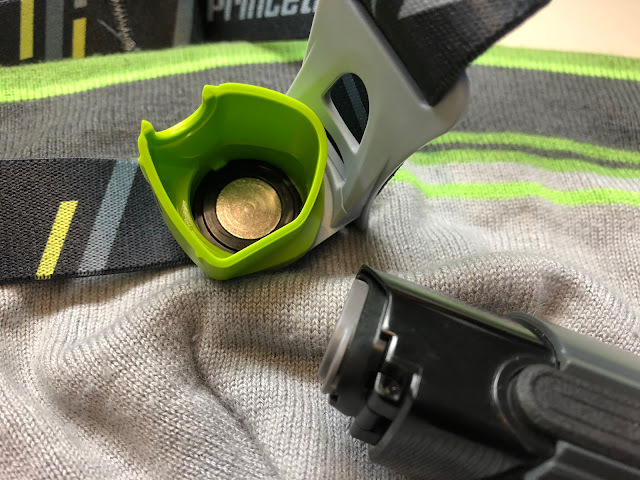 ), has a USB rechargeable battery pack that can be swapped out for replacement rechargeable battery packs, or, 3 AAA batteries, projects 350 lumens for just over 2 hours and costs $69.99. 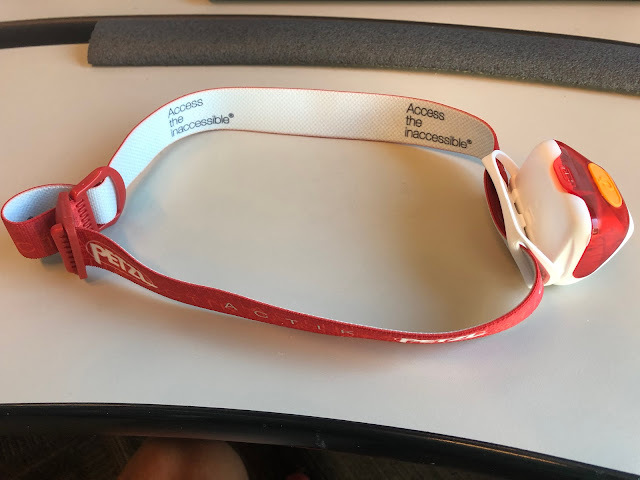 The Actik Core feels impossibly light and minimal which is a huge advantage, as the lighter the weight, the less I have to crank the headband and thus minimizes bouncing and headaches. The size is reasonable small and when I am not using, can easily fit it into any running shorts pocket. I love the versatility of the Hybrid battery technology, where I can easily recharge the battery pack day to day, without wasting batteries or messing around with a AAA battery charger (which I find to be a hassle, as most small headlamps require 3 AAA batteries and the chargers require even number batteries for charging). If out for long nights, I would pack along extra AAA batteries, or get an extra battery pack. 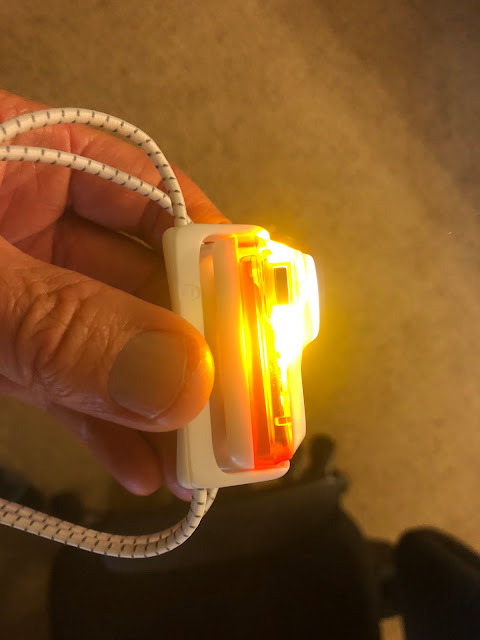 The Actik Core will burn much longer than 2 hours if you are using the lower light settings, predicted at 7 hours for the 100 lumen setting or 160 hours at the 5 lumen setting. 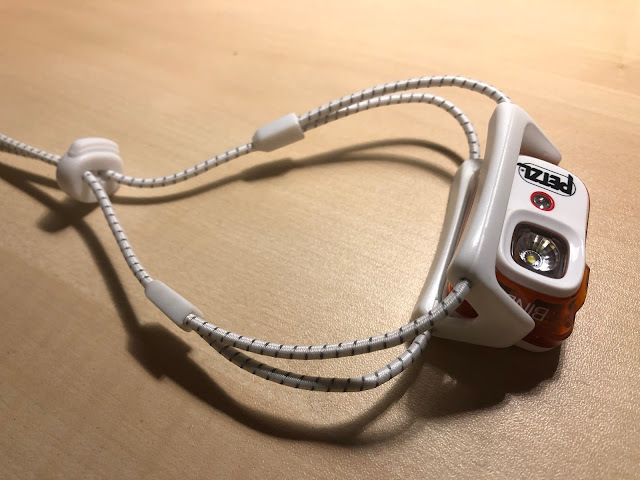 The 5 lumen setting would work in an emergency, or just using around camp and not bothering anyone. 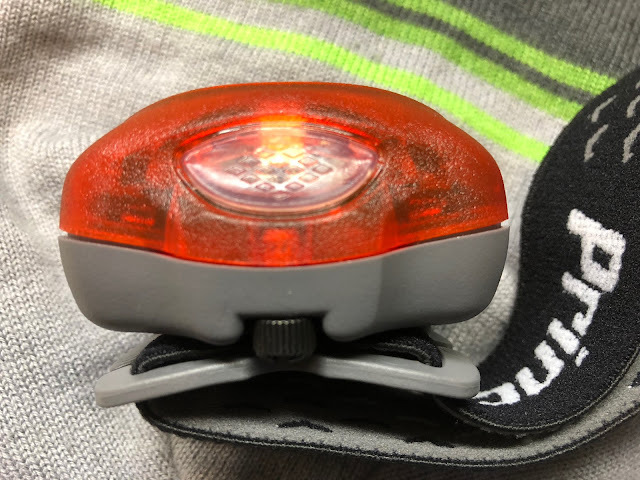 The 100 lumen setting is sufficient for hiking or running on less technical terrain, but for really dark and technical trails, I much prefer the highest 350 lumen setting. The 350 lumen setting is impressively bright and warm, providing a very nice simultaneous balance of flood proximity and distance spotting. Even at the darkest times and roughest trails at any pace, I never feel as though I need more. Toggling through the light modes with the single button is easy and intuitive, even with gloves on. 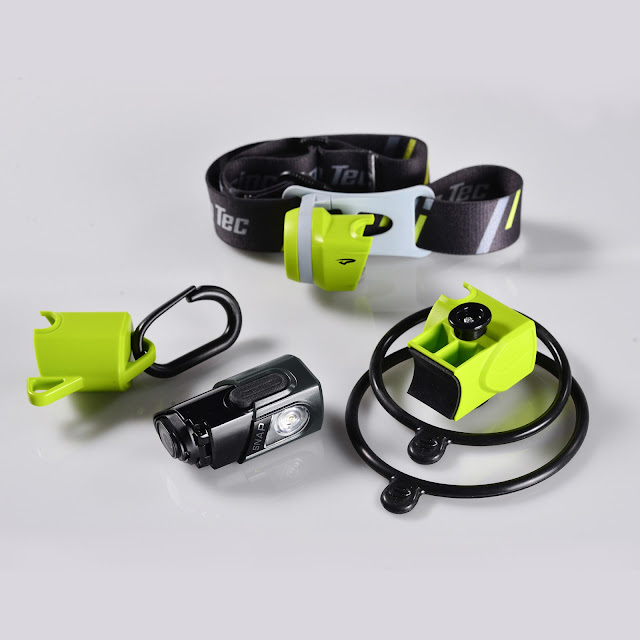 The Actik Core even has a whistle built into the strap, which combined with the strobe setting may help get you out of a bind. This is by far my favorite light of the bunch and the most versatile light I own, my first pick for the majority of my runs in the dark. The Bindi is a miniature wonder, weighing in at just 35 grams and projecting a max 200 lumens for 3.5 hours. Instead of a normal headband style strap, the Bindi relies upon a stretchy cinch cord that is light, minimal, comfortable and versatile, which can also be worn around the neck, as the Bindi lamp also rotates 360 degrees within it's mount for added versatility. Like the Actik Core, the Bindi charges with a USB cable, but unlike the Actik Core, the batteries can not be removed or replaced in any way. The Bindi is an ideal option for night running in urban areas, smoother, less technical paths and trails for those who are looking for the smallest, lightest option but still with enough light to truly project enough light. Though I would pick the Actik Core for any sustained night running, especially on technical trails, the Bindi still works reasonably well for shorter amounts of time for this application. I'll often choose the Bindi when I know I'll only be running on a technical trail in the dark for a short amount of time, or pack it in my pocket or vest just in case I am out after dark. It is so lightweight that I don't even know I have it along. Sometimes I'll bring the Bindi along as a supplemental light, or just a backup. 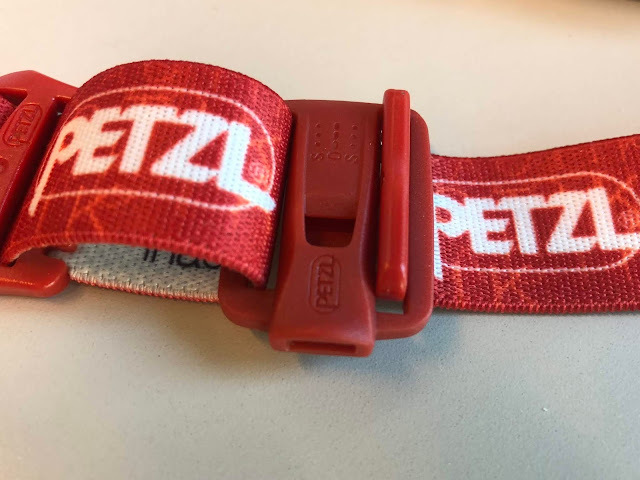 Petzl lists 2 hours for max 200 lumen burn time, but I have observed up to 3.5 hours of max output. My only (very minor) suggestion for improvement would be the transparent colored casing, particularly as it wraps around the bottom of the light. When illuminated, the orange glow shines downward, which can be slightly distracting and especially distracting if you wear glasses. I was however able to quite easily fix with a piece of electrical tape (being careful to carve out a hole for the USB charging port). 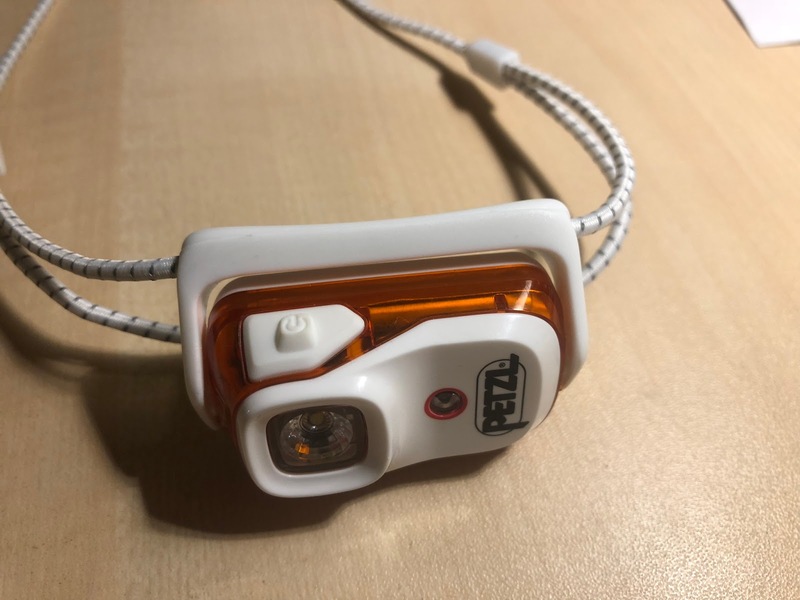 The Vizz is compact and built sturdy with a single button on top to toggle through the lighting modes, starting with red for better maintaining night vision, then spot and finally flood. When in spot or flood mode, you can long press the button to dim or brighten. I have seen this feature on other lights (the light on our bedroom ceiling fan for starters), but what I really appreciate about the Vizz is that when you are at the lowest or highest, it does a quick flash in order to let you know you have reached that point (unlike my ceiling fan light or other headlamps that leave you guessing). 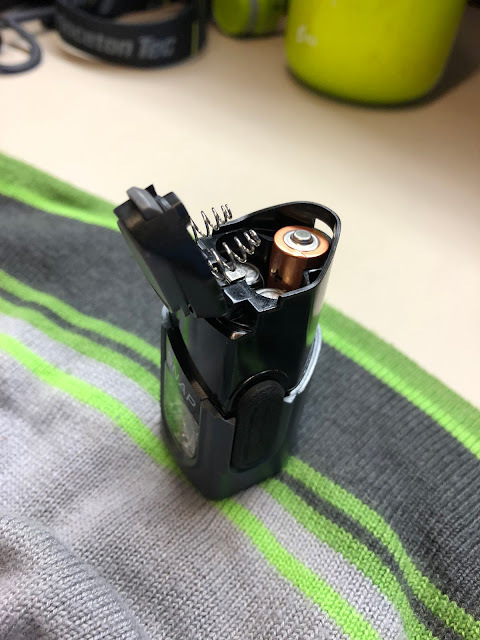 Replacing the 3 x AAA batteries is easy with a small hand screw knob (that can also be even further tightened with a screwdriver, a penny or a dime). The large center light is the spot beam, the two on either side are the red lights and the outer lights are the flood/proximity lights. 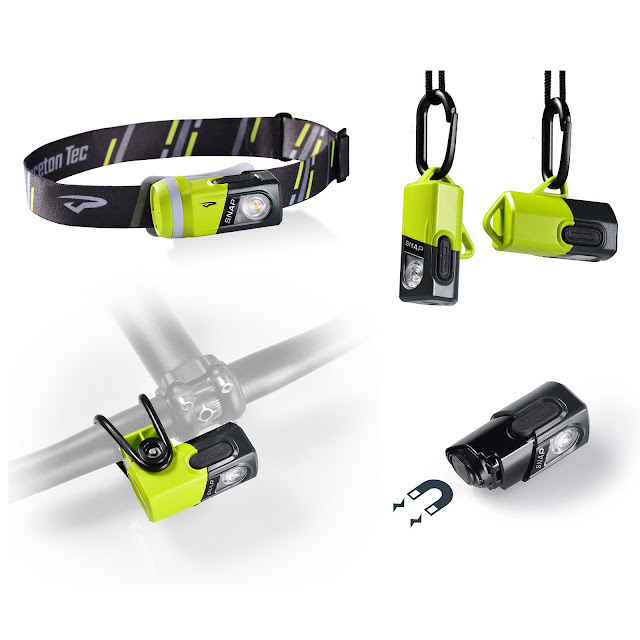 The Vizz is an impressively bright headlamp for it's relatively small size and low weight. The spot beam is impressive and the red and flood/proximity are great for general use around camp or pre dawn futzing. My only minor suggestion for improvement would be to reduce the weight some. 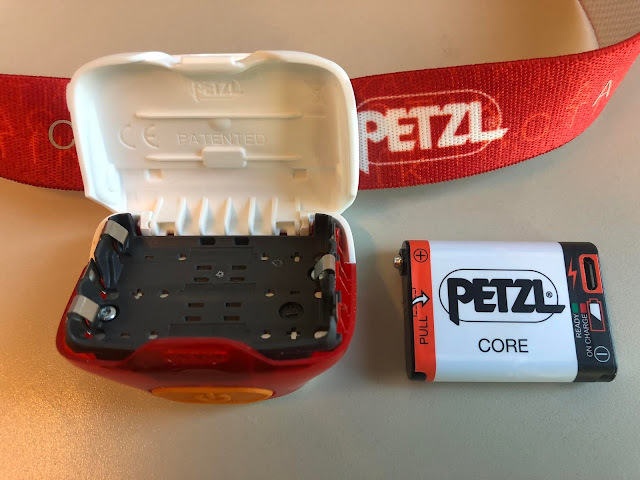 Though it is only 10 grams heavier than the Actik Core, that 10 grams feels significant in the hand and even more so on the head, as I find that I need to tighten the Vizz a lot to get it tight enough where it does not bounce and judder when running downhill or just running fast. 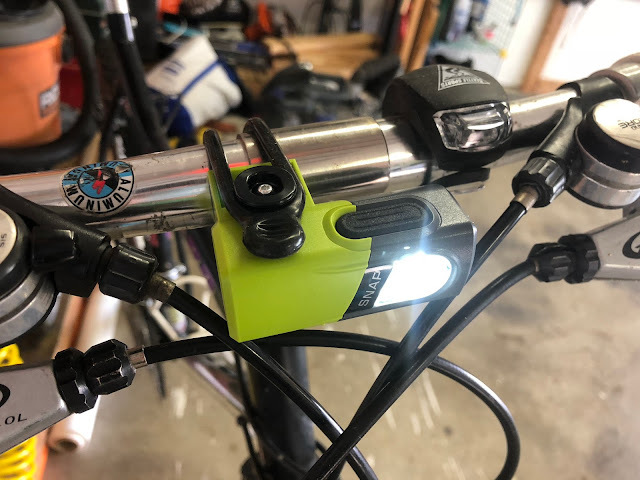 Even heavier than the Vizz and less than half as bright, I am most impressed with the versatility of the Snap, as the light can transfer easily with magnetic lock to several included mounts for bike, lantern or running. Like the Vizz, the Spot employs a single button operation, but with no flood or red light, just spot beam. Long press dims/brightens and has the highest/lowest indicator as does the Vizz. Double click for flashing white light, great for safety/visibility when cycling. The light pops out of the mount easily (though is quite secure and would never fall out). Inside the housing is a dime size magnetic attachment. Simply pop the lid to easily replace the 3 AAA batteries. The bike mount is easy to install with a few different sized bands for various size mounting options. The mount stays securely in place. 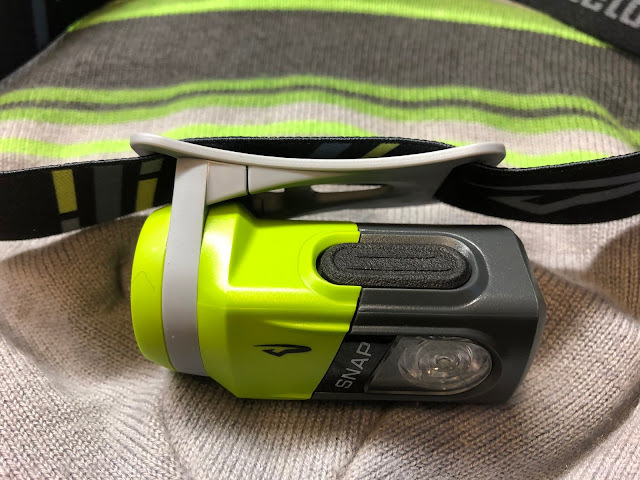 It goes without saying that headlamps are improving, with a steady progression of more lumens in smaller/lighter units, with generally improved battery life (though sometimes not when factoring in the increase in lumens). Each of the models reviewed are excellent choices depending on your usage and preferences. 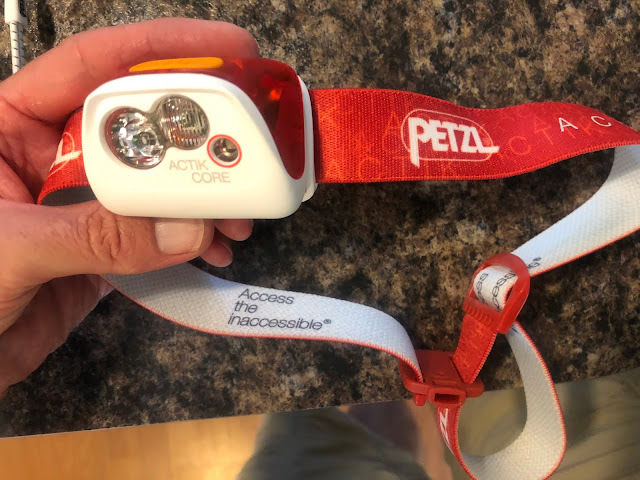 Petzl Actik Core - This is my favorite of the bunch and packs a lot of lumens into a small package. I like that it is very lightweight, with no bounce, judder or need to overly tighten on my head when running, especially nice when running fast or on bouncy downhills. Combined with being lightweight, it is also very compact and tucks easily away into any of my pockets when not using. 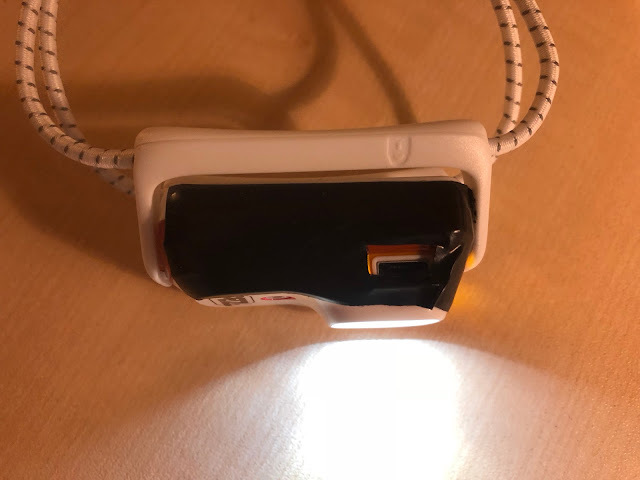 The broad, bright and far reaching adjustable beam that it provides is impressive, battery life is good and I appreciate that I can easily charge with the USB charger/battery pack, instead of futzing around with AAA batteries, making life easier and increasing my likelihood of having a fully charged light when I go out. The Actik Core is my first pick on most runs where I will need a light. 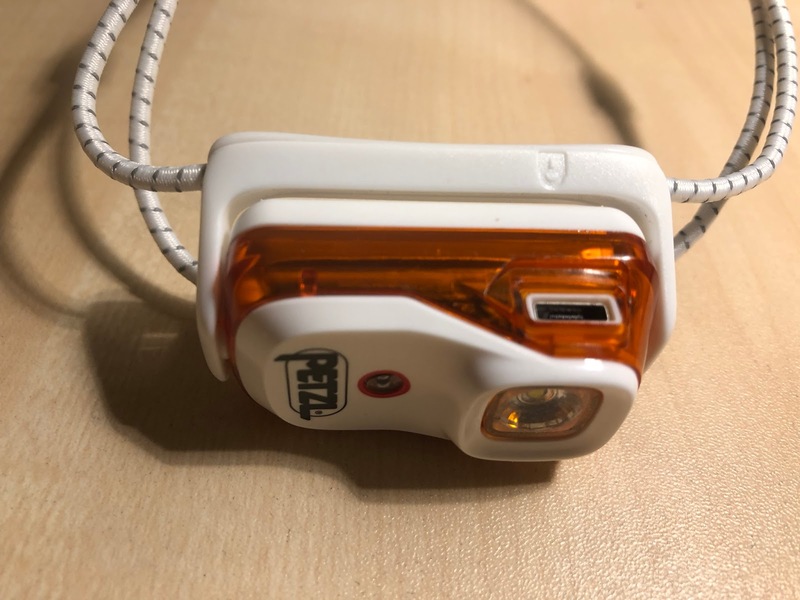 Petzl Bindi - Micro in size with 200 lumens for over 3 hours, easily rechargeable with USB, the Bindi is an impressive little light, ideal for urban running or trails that are less technical (even though I do find it to be sufficient for any trails for shorter periods of time). Wearing the Bindi, you don't even know it is there and stowing in a pocket, you have to be careful not to lose it, as it is so small! 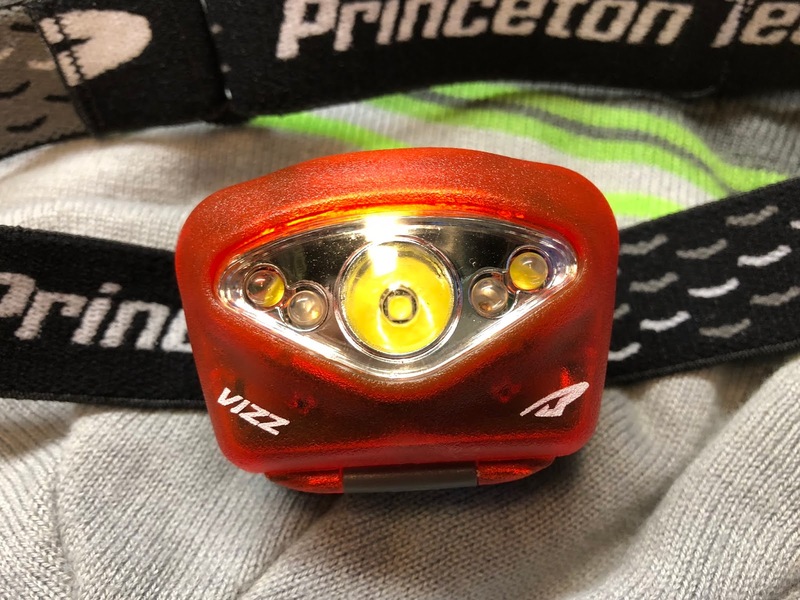 Princeton Tec Vizz - Putting out 420 lumens in such a relatively small package, the Vizz is a great choice for a wide range of use. Definitely a good value too at $49.99. 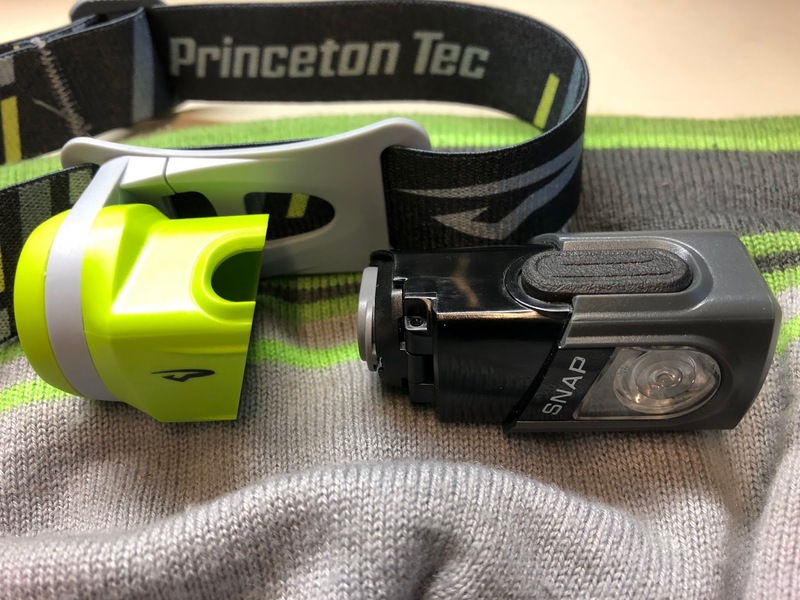 Princeton Tec Snap - A handy and versatile light for a wide range of use from running, hiking, biking and around camp. Comes with all of the hardware for a reasonable price. the colour (colour temperature) and CRI of headlamps is very important to me. i find if a light is too too white, or "cool" i cannot discern the variations in the terrain. everything kind of flattens out. this slows me way down as i worry about wrecking a foot, ankle or leg. what "kind" of light do these headlamps put out, please? are you able to see ruts and holes and dips and such clearly? Anon, thanks for reading and I know exactly what you mean. All 4 lights, though they have varying output and modes, put out a white light. The Actik Core seems to give me the best overall feel on the trail because of a combination of the output and breadth of the beam. To help with my night balance, I think having a light on the waist, as well as on the head, combined with sheer output helps me a great deal. Stay tuned, we have a real interesting 800 lumen light review upcoming!